The folks over at The Diesel Driver bring us a review of BMW’s Hydrogen 7 model built on the previous generation 7 Series platform. Late last year, BMW confirmed that a new Hydrogen 7 built on the F10 model is not going, at the moment, into production. BMW emphasized that this is not the end of the hydrogen development program and testing and research will continue behind closed doors. “So it was not surprising when BMW, in September 2006, introduced the BMW Hydrogen 7. The Hydrogen 7 is equipped with a dual-mode 12-cylinder internal combustion engine based on BMW’s 12-cylinder 6.0-liter gasoline engine used in the 7er Series. 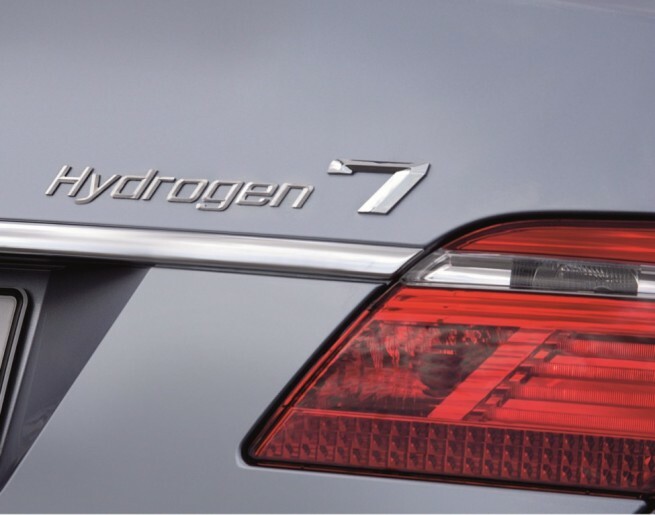 The BMW Hydrogen 7 was the world’s first hydrogen-drive luxury performance automobile for everyday use (n.b. BMW previously built hydrogen-powered test vehicles, such as the 750HL, but they were not put into production). The 203.9”-long Autobahn cruiser came equipped with every conceivable option, including BMW’s Comfort Seats, which feature 14-way power adjustment; Active Roll Stabilization, an active suspension control system designed to reduce body-roll, or lean, when cornering; Bluetooth wireless technology connecting the mobile phone to the car; Comfort Access, which allows the driver to leave the key in his pocket to unlock, start, and lock the vehicle; the iDrive cockpit controller; and the Logic7 Audio System, with Digital Signal Processing (DSP) and 13 speakers. The Hydrogen 7 went through the standard BMW product development process and was produced in Dingolfing, Germany, alongside other production BMWs, including the gasoline-only and diesel-powered 7er and 5er. The Hydrogen 7, unlike your typical car, has a release valve on the roof in case the system needs to release hydrogen. The presence of this valve meant that the car should not – under any circumstances – be parked indoors. This made me slightly apprehensive, but I was assured that, unlike the Hindenburg, liquid hydrogen won’t explode, although it will burn. In that regard, it is probably safer than gasoline if it spills. Most cars also don’t have a very large, insulated tank in the trunk of the car – a tank so bulky that, even though the seats were moved up 4.5”, there is still a bulge visible behind the rear seats. Also during my orientation, I learnt that liquid hydrogen must be kept at -423° F (-253° C). Only liquid helium, at -452°F (-268° C), is colder. We drove the car to the hydrogen filling station and topped it off. I was handed the key, I plotted in a course for Newport Beach via the Pacific Coast Highway, and off I went. I didn’t know that I was about to become a celebrity of sorts. As I made my way to down to the PCH, I marveled at how normal the car felt. I started to forget about the telltale markings on the side, concentrating both on the road and the magnificent view. All along the way, people were waving and giving me the thumbs-up sign. As I expected, despite its size, the Hydrogen 7 was very engaging from behind the wheel, perhaps best described as athletic and refined at the same time. The twisties in the hills of Los Angeles were easily conquered by this water-spouting beast. Steering was excellent with superb feedback and, while nimble might be an exaggeration, the word did cross my mind more than several times. Head over to The Diesel Driver to read the full review and learn more about hydrogen technology and its use in cars.